Publishers would do well to ape the “binge-watching” phenomenon and encourage “binge-reading” of popular series as a marketing tool. Collins Dictionaries in the UK has declared “binge-watch” its “word of the year” for 2015, following the public’s appetite for watching episodes of series like House of Cards and Breaking Bad back to back. Many of us know people who have done this with their favorite series – the friends who overdosed on that costume drama in which many of the adult characters can’t dress themselves (Downton Abbey), or who gorged on episodes of that thriller in which they break out of one penitentiary only (spoiler alert) to end up in another (Prison Break). But does any of this happen with books? Do people “binge-read?” Should binge-read be in the dictionary? And should publishers use the idea of binge-reading as a marketing tool? After all, we have beach reading, why not binge-reading? Dominique Sandis, Children’s and YA Acquisitions Editor at Psichogios Publications in Athens, Greece, believes it does exist and that it can even have an affect on publishing schedules. 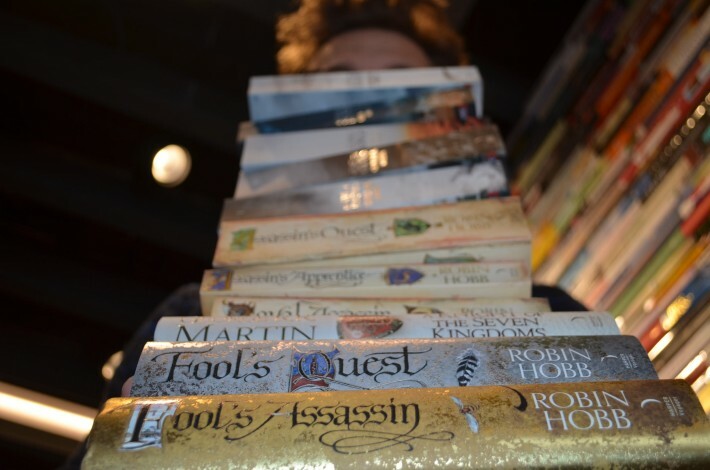 “Market research has shown, for example, that young adults and adults go out and buy all the books of a series all at once rather than gradually. In this way, if a publisher has published a series all together, like Divergent/Insurgent/Allegiant, then you may well have better sales than if you publish the first title now and then follow on with the second book in the series a year or more later. Those who came to Game of Thrones via the HBO series may binge-buy the HarperCollins box set for a weekend binge-read, while creator George RR Martin’s regular fans are famous for pressuring him for the next installments. Many booksellers have stories of those obsessive SF and fantasy fans who ask if there is a date for the next book in whichever series Robin Hobb, or whoever, is currently working on. Binge-reading seems most applicable to series fiction where it is the same imagined world every time, so that the reader is immediately on familiar territory with the new book, as in Fifty Shades for example. It works less well with contemporary, more literary fiction, though it is worth noting that one hears of all kinds of modern novels being ‘continued’ on Wattpad. Indeed, perhaps authors should consider revisiting their characters more often, which might lead to ‘binge’ sales of their work. Collins’ announcement is certainly part of the publishing calendar in the UK, a sure sign that the end of the year is coming. The UK’s two biggest dictionary publishers, Collins and Oxford University Press, do this every year, putting out ‘word of the year’ press releases, which are always gleefully seized upon by the media. Oxford’s ‘word’ wasn’t even a word this year – though, ironically, a word is used to describe it. Its ‘word of the year’ for 2015 is a pictograph, the ‘face with tears of joy’ emoji, which apparently comprised 20% of all emojis used in the UK in 2015 and 17% in the US, according to research OUP carried out with mobile technology business SwiftKey.